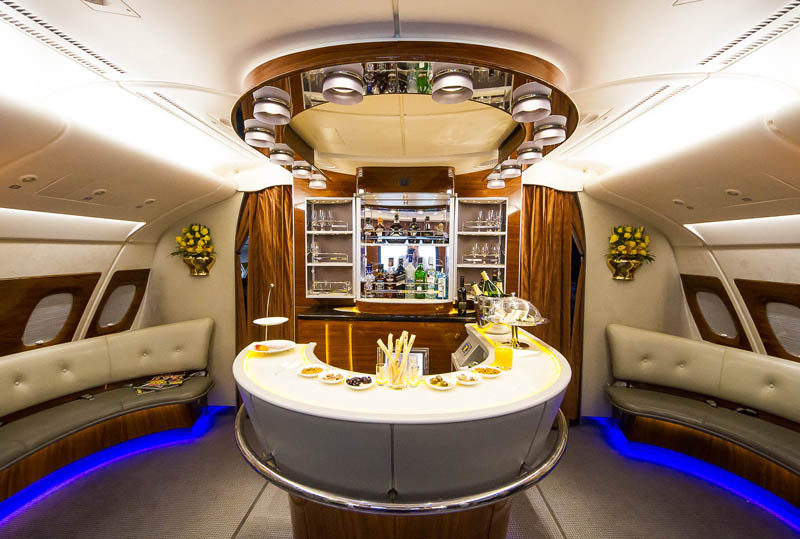 Emirates provides one of the best business class experiences in the air on its flagship A380s, with great service, dining and comfort on board. Flying with Emirates is a convenient and popular choice for travellers around the world, and in Australia we have the added benefit of the airline’s partnership with Qantas. 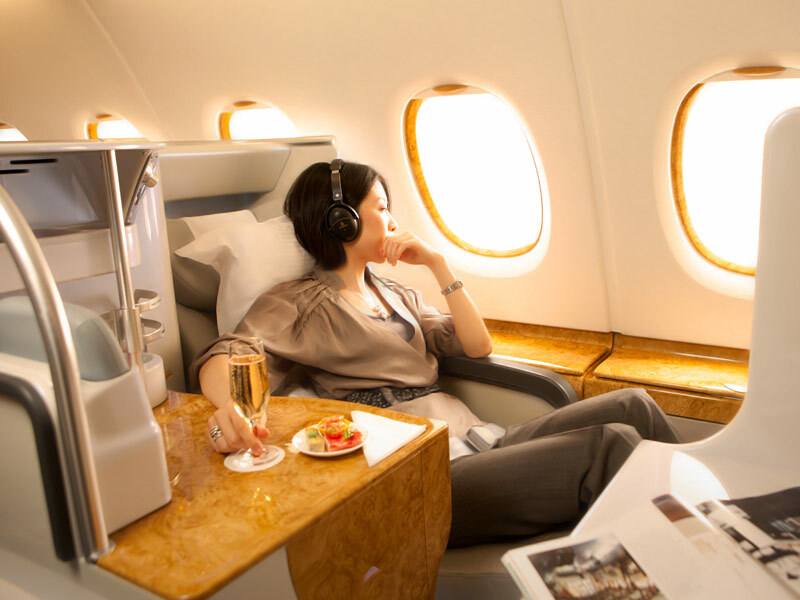 If you are a Qantas Frequent Flyer member, Emirates A380 business class is a superb use of Qantas Points. I really enjoyed my recent flight from Melbourne to Singapore. 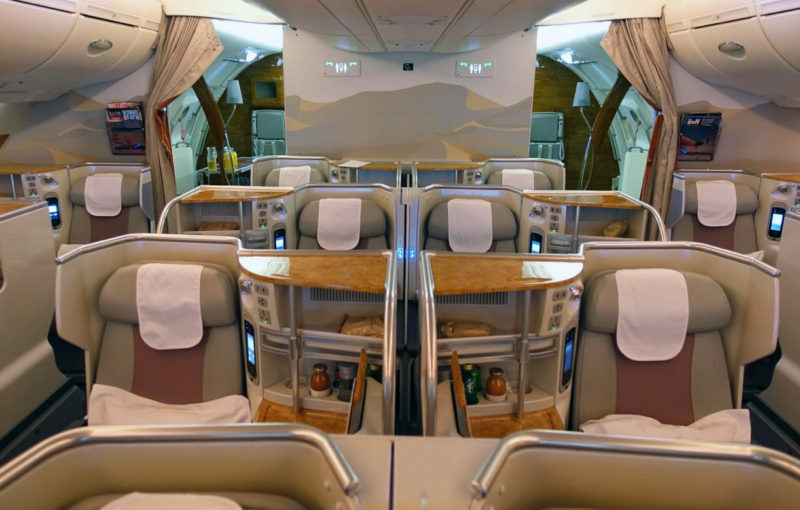 Here are the highlights and what you can expect if you fly business class on an Emirates A380. 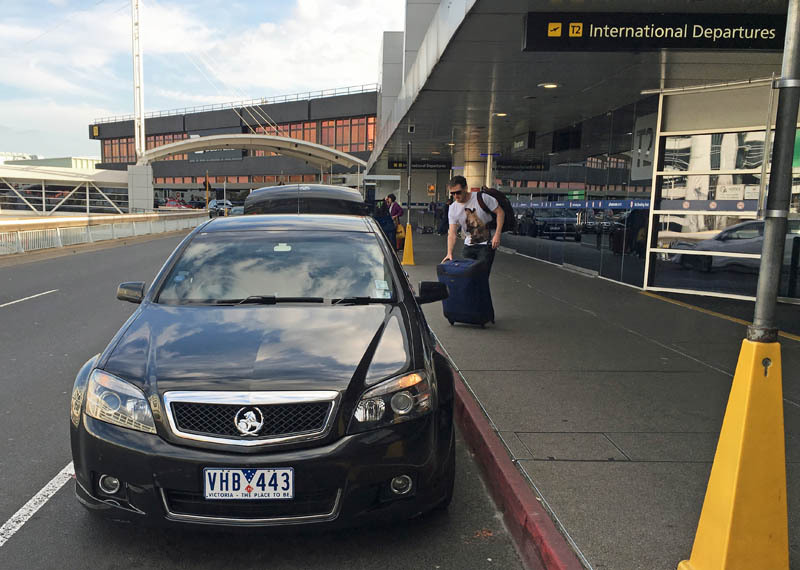 The customer service was one of the best aspects of this flight, and it began before we even reached the airport, with a driver picking us up from home. Emirates’ complimentary Chauffer Drive service is offered to all business and first class passengers (including on award tickets) except those flying to New Zealand. It’s a great way to start a trip! At Melbourne Airport, the check-in process was very smooth and soon we were relaxing in Emirates’ gorgeous lounge. 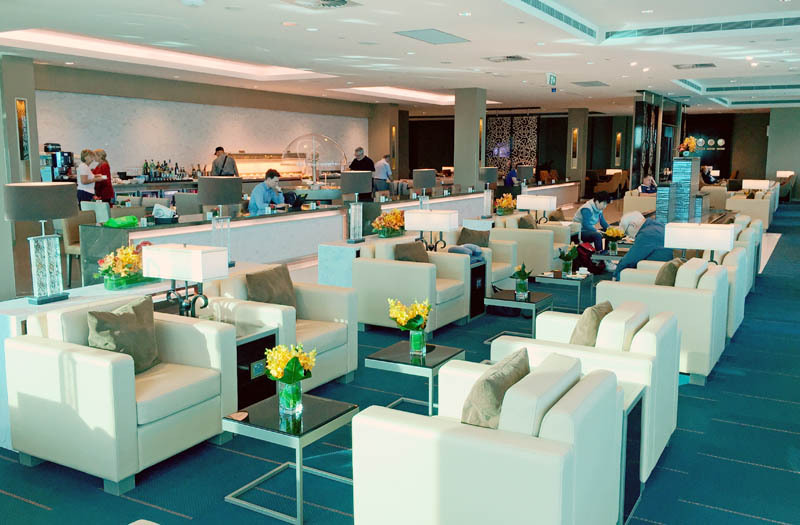 Emirates’ lounge at Melbourne Airport is relatively new. It’s spacious and elegant, with a nice selection of hot and cold food and drinks, including Veuve Clicquot champagne on tap. 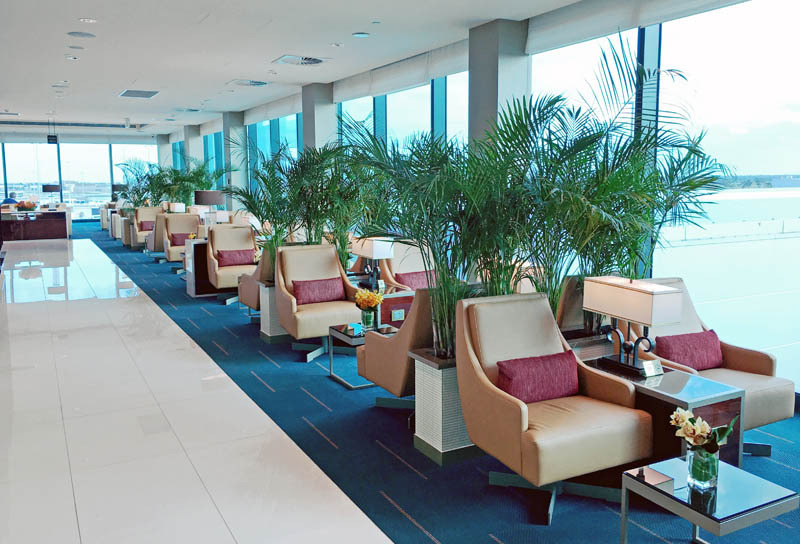 It’s definitely a step-up from some of Emirates more dated-looking lounges around the world. Upon boarding the plane onto the upper deck, we were greeted by the friendly crew, who provided consistently good service throughout the flight. Emirates’ customer service can be hit and miss, but on this flight it was relatively warm and attentive. 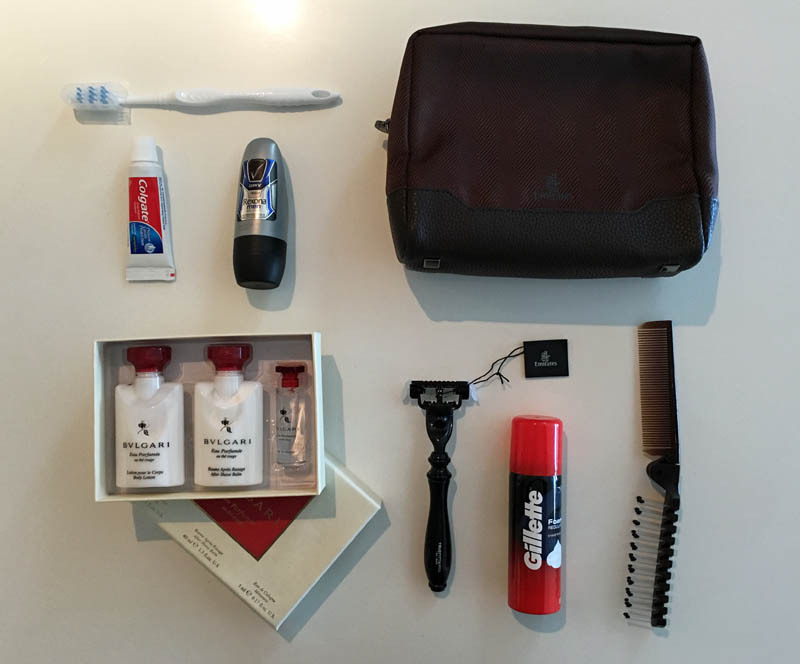 At the start of the flight, we were given amenity kits with all the products one would expect in a premium cabin, including some items from Bulgari. 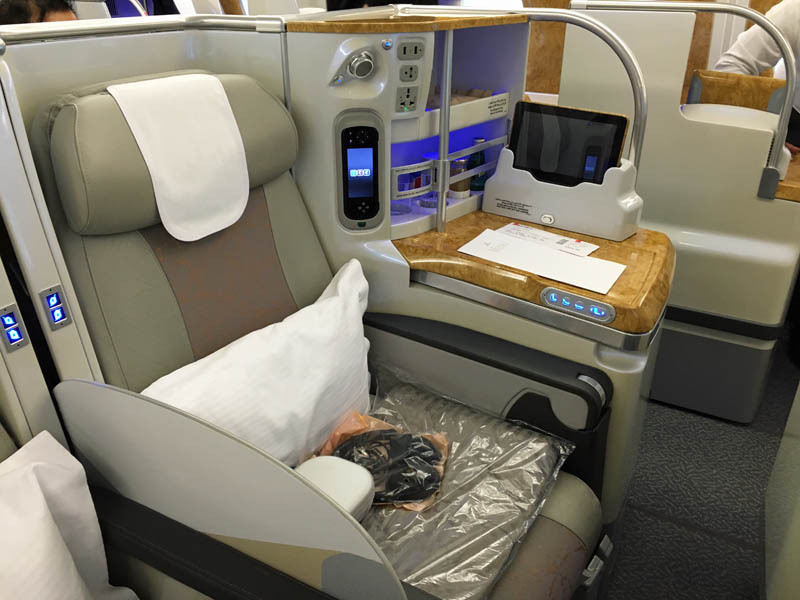 Business class on the A380 features fully lie-flat seats in a 1-2-1 layout, with every passenger enjoying direct aisle access, as is the norm with premium airlines. The seat felt quite spacious and comfortable, though it’s not as wide as you might expect due to the large minibar and console. Bigger people may find it a bit narrow. The layout of the middle seats alternates between rows so that some are couple-friendly while others provide more privacy for adjoining passengers. There is plenty of storage space, and each seat has its own iPad to control the seat and entertainment system. The minibar contains water, juices and soft drinks, but all are at room temperature so you’ll probably need to ask for ice. The seats have adjustable positions, reading lights, massage features, USB ports and AC power. Mattresses are also available if you want to sleep (we didn’t). The food and drink service on our flight was good, though not at the level I’ve experienced with other airlines. Upon being seated, we were offered a welcome drink of water, juice or champagne. I chose the champagne, which was Moet & Chandon NV – a pretty good drop. 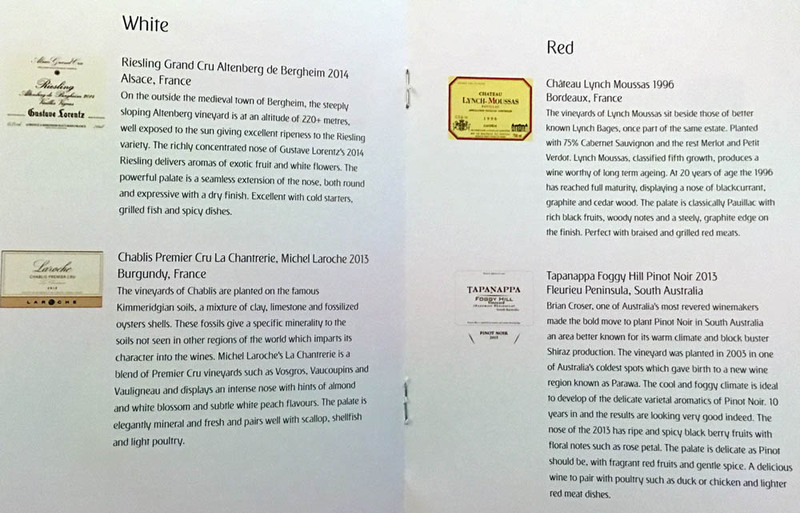 Shortly after take-off the crew began a full drink service, where I was a bit surprised to see that three of the four wines on offer were French (and the other was Australian). More variety would be an improvement. There were also various beers, cocktails and non-alcoholic drinks on the menu. 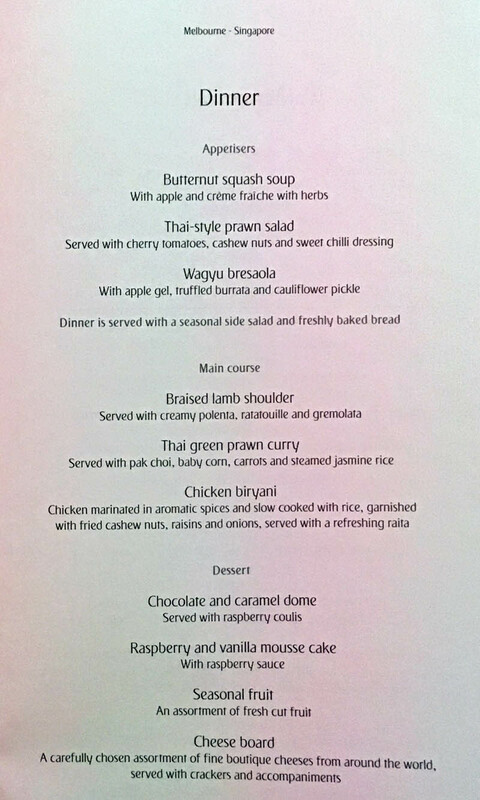 The dinner included an option of a three course meal or some ‘light bites’. I chose the full meal, which included an appetiser, main and dessert. My starter was a Thai-style prawn salad, which was zesty and refreshing. My main dish was the braised lamb shoulder, which didn’t pack as much flavour as I hoped. Overall, both courses were pleasant but not particularly memorable. 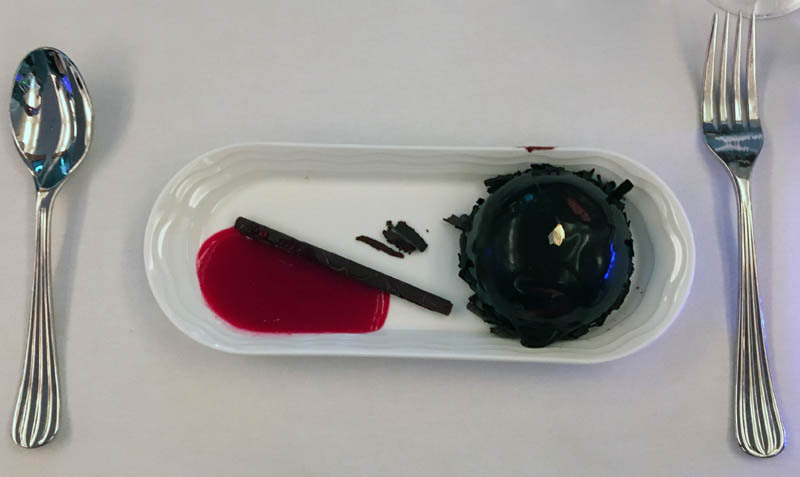 The chocolate and caramel dome I chose for dessert was way too sweet. 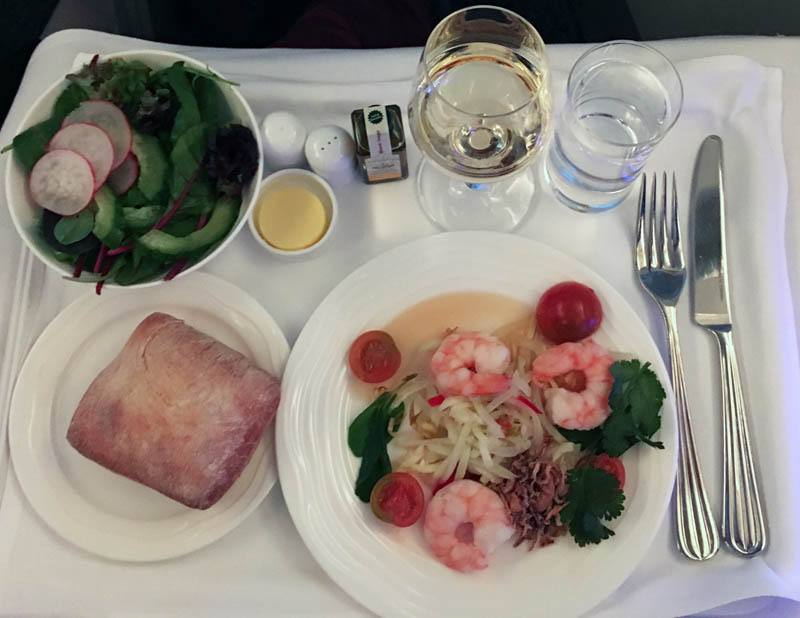 When the meal service finished, we proceeded straight to the on-board bar for the memorable experience of sipping cocktails at 40,000 feet. It was a bucket list moment! The staff were happy to make any cocktails we wanted (that were in their recipe book, so nothing too fancy) and the drinks were pretty good. It’s all about the novelty factor here and being able to enjoy a change of scenery on longer flights. Emirates regularly wins the SKYTRAX award for ‘World’s Best Airline Inflight Entertainment’ and it shows. A380 passengers enjoy a high-quality LCD screen which measures at a generous 20-inches. There was a huge variety of films and TV shows on offer from all around the world, as well as music and games. I definitely wasn’t bored! 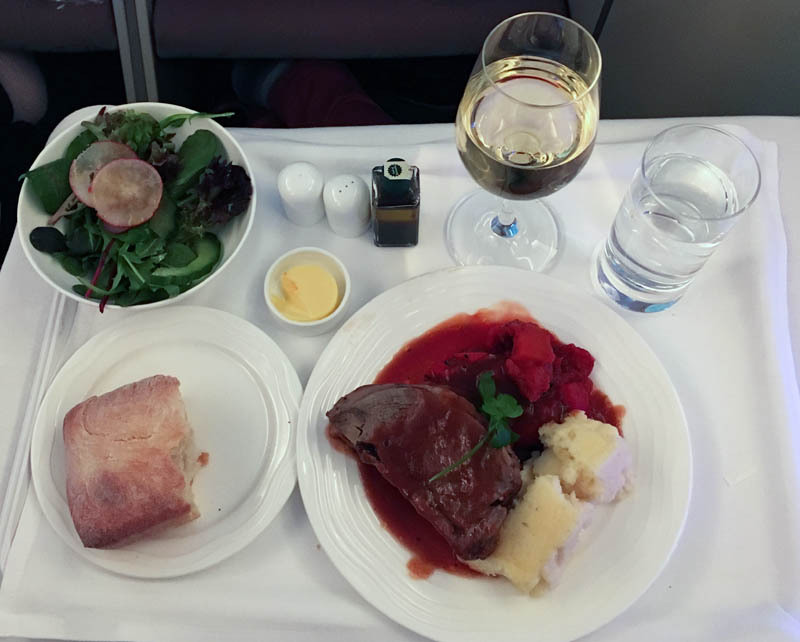 On this particular flight, I enjoyed the customer service, seat and other comforts on board – especially the bar and lounge – and while the food and drinks could have been better, this didn’t dampen my experience overall. 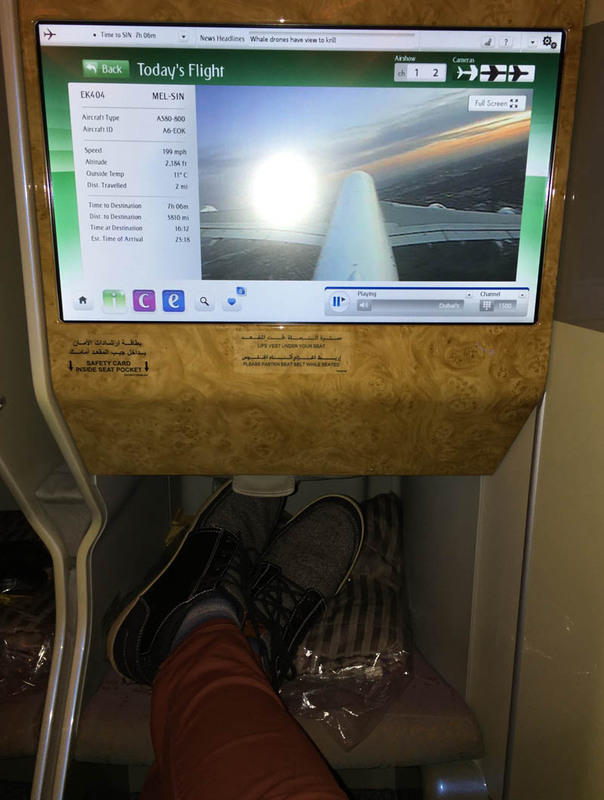 I would definitely recommend Emirates A380 business class to Australian travellers, especially those using Qantas Points to fly to Asia, Europe or the Middle East. Only comment I’d make is I haven’t seen Veuve Clicquot in the Melbourne lounge for a couple of trips now. Maybe I’ve just been unlucky. Great info – cheers! 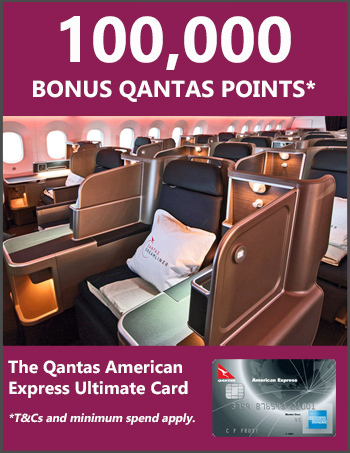 Up until now I’ve been using Kris flyer to get to Singapore, now I’ll explore Qantas points to Emirates!